The Honda CB400 is a current yet ancient model in the Honda motorcycle lineup. The current model dates back to the 1990’s with the prerequisite updates to keep up with legislation. I guess (without research) that the current version is the only model with 4 cylinders in this class which means unique yet memorable performance characteristics. 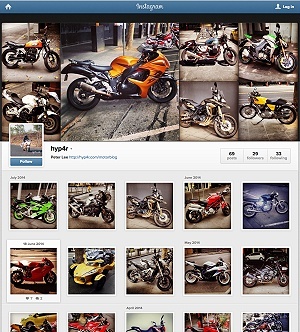 There are other 400cc motorcycles just with less cylinders. The CB400 (naked) represents a classic Japanese motorcycle meaning very neat and tidy appearance and great build quality. It is a smaller version of the current CB1300! There is nothing technically wrong we can think of or see even read regarding its mechanicals hence it should be a reliable model for many years to comes. As a result I think it’s the perfect basis for a cafe racer conversion if you are that way inclined. The 400cc class in countries in 2014 other than Japan is non-existant for arguably legislative reasons. 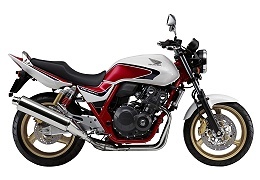 There are also no other 400cc road motorcycles and the only country outside Japan that gets the CB400 is Australia! I predict that this bike will be in high demand when Honda Oz stops importing them. I haven’t ridden one yet at the time of writing as no-one I know currently owns one! Although I may get a ride very shortly since I’m in the process of doing the ‘Best commuter motorcycle’ BLOG entry! The showroom impressions are that has relatively soft road suspension so should be a hoot riding in the city and very comfortable riding position. It should be a good learner bike that can be used a commuter motorcycle later on. Conclusion so far? There are very few low capacity motorcycles that get my attention or keep me interested for long. Fortunately the Honda CB400 is one of the few. (The other is the KTM DUKE 390) The only criticisms that can be aimed at the CB400 is it’s price (new), relatively heavy weight although is well distributed and that it is a naked motorcycle not a sports bike, but that can be an advantage if you know what I mean! The Honda CB400 is a great motorcycle that is essentially a keeper.